You were browsing the Top 10 of BGG and noticed a game called Twilight Struggle. Once you figured out it had nothing to do with teenage vampires your interest was piqued. Strap in, because if you enjoy history and politics, you might be on your way to becoming a wargamer. Wargaming is a niche within an already niche hobby, and sometimes it can be difficult to know where to start. The goal of this post is to orient people with the basic types of wargames, provide a brief introduction to the hobby, and some tips on rules. Wargaming as a hobby has a long history going back to the 19th century. It originated out of the need for militaries to study past conflicts. One of the earliest wargames from this era was the German game Kriegsspiel (literally translated ‘wargame’) which was used to train officers in 1812. Civilians eventually got in on the fun, and there was a “golden age” in the 1970s and early 80s when games like Axis and Allies sold to a large market. While much smaller today, the variety and quality of games continues to shine. A wargame, at its heart, is a conflict simulation model. Sometimes these conflicts are historical (Twilight Struggle, COIN series, Washington’s War) and sometimes they are fictional (War of the Ring, Space Empires 4x). A great wargame will find the right level of abstraction where the conflict is accurately modeled, but rules overhead doesn’t render the game unplayable. Sometimes wargames have a reputation of being long and overly complex. Extra rules that add flavor are often called “chrome.” Chrome is usually added to model specific aspects of a unit, interactions with the terrain, etc. We’ll discuss this issue and the most efficient way to digest rulesets below. However, I would argue, if a board gamer can handle a heavy euro, they can tackle most wargames. Who makes these games and what are the major categories? There are two data points to consider when trying to categorize a wargame: scale and components. The scale of the wargame will typically be at one of three levels: tactical, operational, or strategic. Tactical games often depict one battle or series of battles with small-scale units. Examples include Advanced Squad Leader, Combat Commander: Europe, and Memoir 44. Operational games are broader in scope and may simulate a small war or a campaign within a larger war. 1914: Twilight in the East fits into this category. Strategic wargames attempt to recreate entire wars on a large scale and often incorporate politics and resources. Examples include Paths of Glory, Triumph and Tragedy, and Here I Stand. Because of the scope, strategic level games require a higher level of abstraction. The components of a wargame are also essential when trying to classify it. While not comprehensive, the major types are miniatures, hex and counter, and block. Some publishers have carved out a niche in each of these markets. Miniatures wargames typically involve the use of a fixed playing area, rulers, and metal or plastic miniatures. Games Workshop and their Warhammer line come to mind as the predominant player in this space. Also, Fantasy Flight’s X-Wing and Armada series. (Full disclosure: this is the space I know the least about. Some of these games are really a separate hobby of their own). Hex and counter games use cardboard counters to depict units. Often these counters will have information like nationality, size, type, strength, speed, etc. Paper or cardboard maps are filled with hexes to identify spaces a counter can occupy. There is often terrain info in each hex that impacts units. GMT Games is currently the predominant publisher of hex and counter games. Block games are similar to hex and counter except they use…wait for it…blocks. Wooden blocks stand in for cardboard and are typically facing the controlling player, simulating the “fog of war” inherent in the conflict being modeled. Blocks are rotated on their four sides to represent the strength of a particular unit. 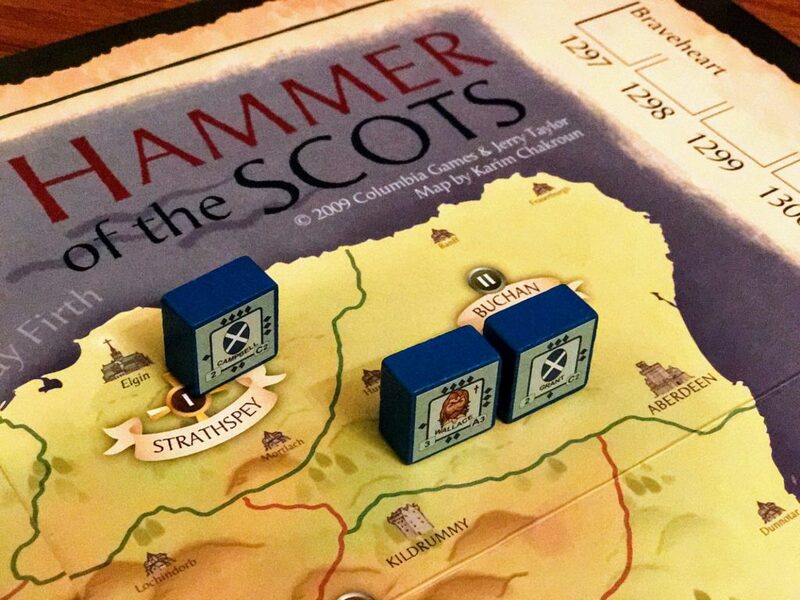 Columbia Games makes some outstanding block wargames including Hammer of the Scots (“Freedooooooom!”) and Julius Caesar. My current favorite block game is Fields of Despair from GMT, which models trench warfare in WWI. Is it disrespectful to play games about conflicts where people lost their lives? Volko Ruhnke, the designer of both games mentioned above, had a great response in a recent interview where he addressed that issue. He answered the question better than I could so I’m including the full quote below. I’d imagine it could be quite emotionally affecting for people to play a game about a conflict they might personally have served in, or where they have loved ones actively involved. Do you need to have a level of emotional sensitivity when you’re designing a game like this? Have you had any responses from people who have either served themselves or have had family involved in the conflicts? 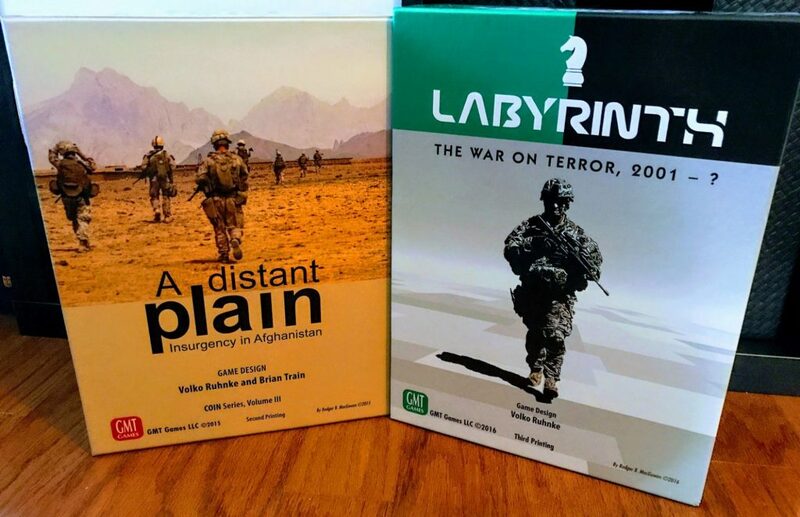 I have, and also about some of the COIN series titles, A Distant Plain about Afghanistan, for example. And it’s usually a very positive response. I’ve found that almost universally, folks involved in these matters understand that games are a medium for examination of any kinds of ideas. And just as with any other medium would oversimplify, or take certain perspectives, or potentially get things wrong. That would be true with a book or a movie or a TV show. It doesn’t mean that we shouldn’t have books or movies or TV shows about very serious matters. And I think that most service members who have served in Afghanistan and encounter my games, as far as I know they’re just happy to have these topics in front of an audience through various media. It doesn’t necessarily mean they think that I got things right, but that’s just not possible. So as a designer do I have to be emotionally sensitive to the recency of the topic, or the searing nature of the fact that it affects people’s lives in sometimes terrible ways? I absolutely do. I go back to Gene’s original commission to me – the very first thing he asked was if I could do an “intelligent” game on this topic. And my premise is that if I am trying as an educated observer to provide a plausible model of recent history, and if that’s what “intelligent” means, then that is inherently respectful. I’m not trying to romanticize, I’m not trying to make anything frivolous. Games can be trivial, but I’m hoping that Labyrinth isn’t trivial. It’s a simplification of a very complex affair, but I hope that through its attempt at plausibility, to examine what are the relationships here, what do we think is real and not real, that it’s inherently serious and therefore respectful. That doesn’t mean it’s not fun. I love historical documentaries. For me, watching them is fun. If they’re about warfare or the plague or something, it doesn’t mean I find war and the plague to be fun. It’s fun for me to examine history and to try to understand it. That’s what I think historical simulation games are, and what I hope Labyrinth is. So for the people who are affected by these affairs directly, it’s saying: here is a piece of media that’s trying to grasp what’s happening and what you’re going through. Why do these rules look like the tax code? How do I learn efficiently? One of the most intimidating factors about wargames is the level of rules complexity. 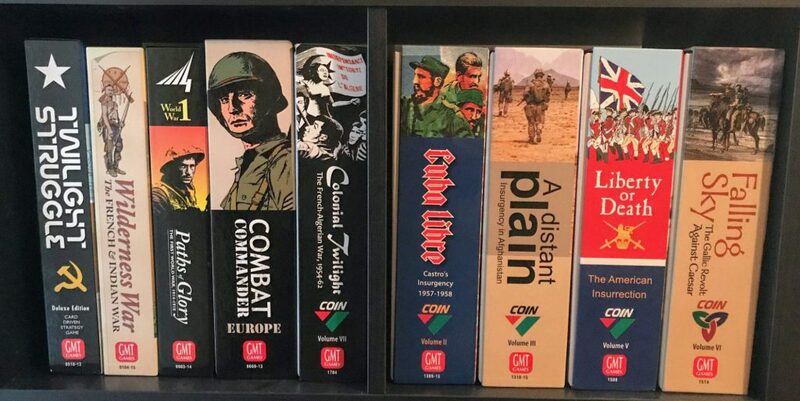 Because these games attempt to model actual conflicts realistically the “smoothness” of a game is often sacrificed for the historical accuracy of a particular unit or piece of terrain. The first wargame I attempted to learn was Paths of Glory. Because I was unfamiliar with the structure of wargame rules, it took at least half a day just to digest the core mechanics. However, there is hope! Below is my process which has dramatically cut down the amount of time it takes me to learn a new game. This will help you get a feel for the map, units, and counters you’ll be playing with. If you try to read the rules without looking at the components, the context is lost. This makes it much more difficult to track a game’s flow. 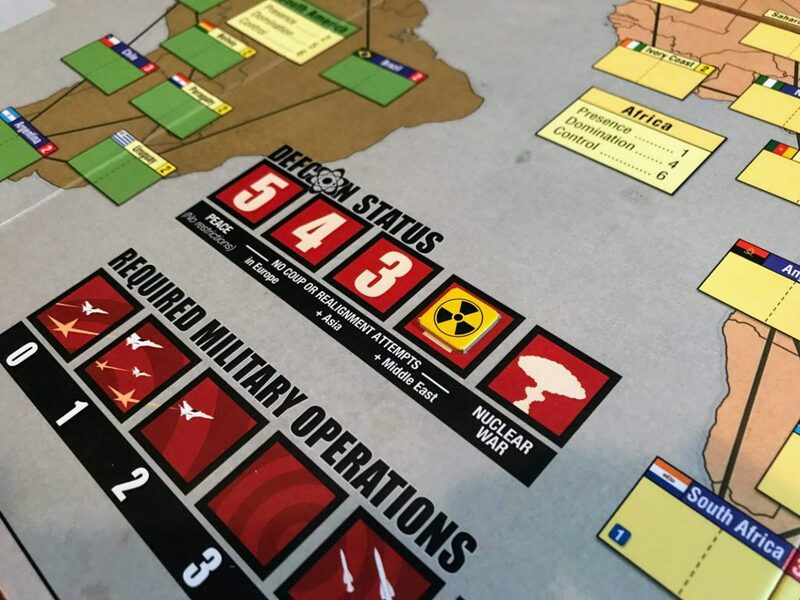 Almost every wargame, regardless of publisher, has a section titled “Sequence of Play.” Before you read about units, terrain, and rules exceptions it’s extremely important to have a high-level overview of how a game flows. As you venture into a game’s “chrome” keep in mind the core sequence of play. Step A happens then B, etc. Knowing the core decisions and mechanics will make internalizing the exceptions much easier. I was recently teaching the game Triumph and Tragedy, explaining the rules for sea invasion. Rather than just reading from the rulebook, I asked the players to think about the invasion of Normandy. You can’t just land all your troops at once. They have to stagger in over time. If you can find a way to connect rules to theme, this can really cement the game mechanics in the minds of a new player. Time is precious. Nothing can stretch the length of a game like having to constantly refer to the rule book. Some referencing is unavoidable, but it can be reduced significantly by setting up the game beforehand and playing all sides yourself. For those that are tactile learners, moving the pieces around the board can make abstract concepts more accessible. The majority of GMT Games’ products come with a printed “Playbook” which will walk new players through setup and sample play. Setup the game and walk through all the examples prior to meeting up with players. Your actual gaming time will be much more efficient and enjoyable. There is also the tradition in wargaming of solitaire play for its own sake, either with “bots” (i.e., flow charts) or simply playing all sides. I’ve done this for lengthy games that are difficult to get to the table, and it’s a fun way to explore a conflict you are interested in. What is the best introductory wargame? Numerous wargames cater to new players. Block games, in particular, tend to have far fewer rules and can introduce core wargame mechanics. 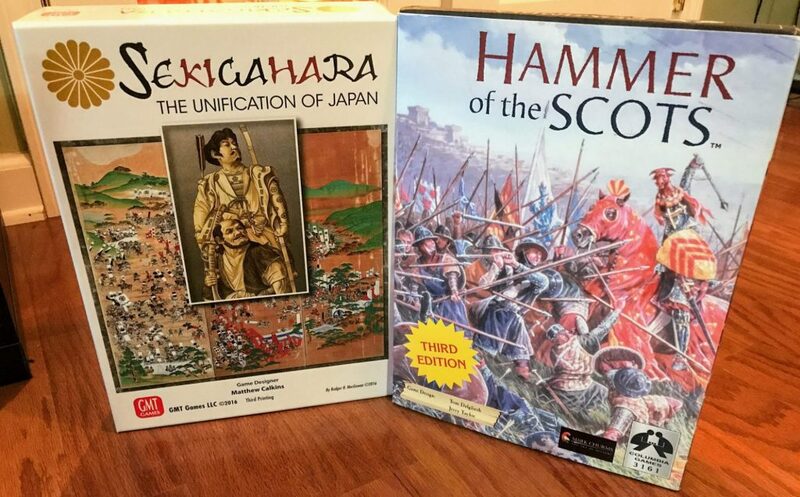 Two I really enjoy are Sekigahara: The Unification of Japan and Hammer of the Scots. Both are games that can be played in around two to three hours and (most importantly) are a ton of fun. Really though, the best thing to do is pick a conflict or time period that interests you most. Chances are there’s a game for it. Jared is a CPA/programmer working in Nashville's healthcare industry. His primary gaming interests include economic games, abstracts, and wargames. Thanks for this article! War games are an area of board gaming I’m getting more interested in (had my first couple of games of Twilight Struggle recently and have a copy of Labyrinth that I’m looking forward to trying soon). Really appreciate the overview and thoughts on where I might go from there! Other popular miniature war games include: Infinity, Bolt Action, Flames of War, Dropzone Commander, Frostgrave… the list goes on. But they require a bit of investment as most need you to model and paint an army in addition to terrain and a large tabletop. Dropzone Commander was lauded when they released a 2 player box set a couple years back as it came with units, simplified riles, a fold out city map and all the scatter terrain (skyscrapers) you’d need to enjoy the game out of the box. Overall pretty “turn-key” from a tabletop miniatures wargame prospective. You still needed to build the models, though nothing a little superglue cannot handle. Most of what Fantasy Flight Games is doing with Star Wars: Imperial Assault, XWing, Armada… is a lot more accessible too, as those games come with pre assembled and even painted miniatures in some cases. Not to mention that the IP appeals to a large audience. Don’t forget Devil Pig Games, their Heroes line of games doesn’t quite fall into the Hex-and-Counter catagory, but is it fun, and no modeling required. Here’s a few suggestions for starter/intro games within several, esp. the hex/tactical, genres. 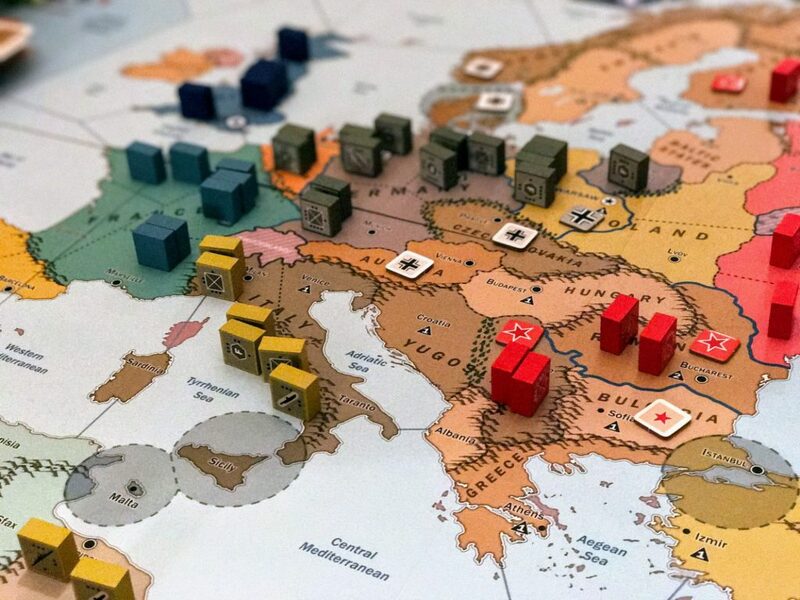 More people should play board games about history, including wargames. While the article is a good introduction to the genre, I disagree that block games are the best choice of the game types. I agree that the lack of information may not work for some gamers who are unfamiliar with that mechanic. The best way to introduce someone to a different game type, this applies to any game genre, is to suggest a game that has a theme (or historical period) that interests them. Chose a game that is easy to comprehend, and that you can teach well. It may be a block game, if that game choice is BEST for the audience. Just because YOU like a game, that does not mean that OTHER people will like it. Introducing new people to a new side of the board gaming hobby is a loss leader. The key is to play fun, and engaging games. Last night I taught ‘Black Orchestra’. A fully co-operative game with a heavy ww2 theme. Later I taught Table Battles to an ex-military guy. Last week I introduced a group of euro-gamers to ‘Wings For The Baron’, a cut-throat game of profiteering in ww1 Germany. There are many great wargames that can introduce new people to a new aspect of the hobby. Choose the best wargame for your audience. Choose one of the many crossover games. Think about the game choice that suits your audience. Teach them the game well. Give them good advice. Warn them of mistakes. Don’t cream them to show that you know the game better than them. Let them win or lose fairly. My recommendations is based on the following background; I have been a gamer for over 35 years, I run several game groups, and I have been a game teacher at the Wargame Bootcamp in the Los Angeles area for almost 10 years. Thank you, your article helped me understand about conflict scale. What is the WWII game illustrated at the beginning of the article? This article was fantastic! Thank you! As a Solo Boardgamer and professional historian, I’m looking to make the jump into wargames, especially simpler block games. Are there any that have an official solo mode or are easily adapted to solo play? There is definitely some good stuff here. Just a few thoughts. The first, is that games like X-wing are easy games to start since they tend to have only a handful of units play. For those of a more historical bent Wings of Glory (Previously Wings of War) does something similar with WWI and WWII, with the WWI version probably being the easiest of all of these sorts of games. Most historical miniatures games tend to published by relatively small groups and are more likely to keep the rules reasonably simple since paper is the only way to keep track of things like damage. Neil Thomas wrote a book called “Wargaming An Introduction” that provides all the basics for getting started in historical miniature wargaming. Great comments, thank you for sharing William!